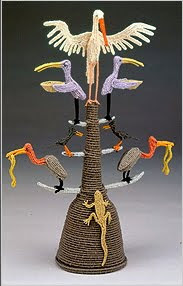 "Spell of the Green Lizard" 1995 / Artist: Carol Eckert / Cotton, wire, 11 1/2" x 7 1/2" x 3 1/2"
A rare collection of contemporary baskets including functional vessels as well as expressive works that challenge traditional definitions of basketry, has been promised to the Museum of Arts and Design by Sara and David Lieberman. With their passion for collecting contemporary craft and their exceptional openness to new forms and ideas, the Liebermans have assembled one of the best compilations of contemporary baskets in the country. Their collection will be presented for the first time in New York in the exhibition Intertwined: Contemporary Baskets from the Sara and David Lieberman Collection, from March 16, 2010 and through September 12, 2010 at the Museum of Arts and Design. Sara and David Lieberman’s interest in baskets has coincided with a fifteen-year period of innovation and energy in the field. They first began acquiring baskets for their function and grounding in ancient traditions, but soon their selections included new works of great “vitality and vigor” that were more about “expression and communication” rather than function. The Lieberman collection now includes work by Ed Rossbach, Katherine Westphal, Sally Black, Kiyomi Iwata, Kazuaki Honma, Dorothy Gill Barnes, Carol Eckert, John McQueen, Elsie Holiday, Ferne Jacobs, Norma Minkowitz, Fran Reed, Lisa Telford, Kay Kahn, and many more. Intertwined: Contemporary Baskets from the Sara and David Lieberman Collection is organized by the Arizona State University Art Museum, Tempe, Arizona, and curated by Senior Curator Heather S. Lineberry and Jane Sauer, nationally known basket maker and scholar. The exhibition is coordinated at MAD by Assistant Curator Laura Stern. The presentation of the exhibition at MAD is made possible, in part, through the generosity of the Inner Circle, a leadership Museum support group. Intertwined : Contemporary Baskets from the Sara and David Lieberman Collection is accompanied by a 48-page fully-illustrated color catalog which includes an essay by nationally-known curator and scholar Kenneth R. Trapp, former Curator for the Renwick Gallery of the Smithsonian American Museum and the Oakland Museum of California and a short piece by Los Angeles artist Ferne Jacobs. The Intertwined exhibition includes work by San Francisco Bay Area-based pioneers in the field including Ed Rossbach, Kay Sekimachi, Lillian Elliot, Gyöngy Laky, and Katherine Westphal. Among the 70 works in the exhibition is traditional work by Native Americans and innovative work by major contemporary figures, expanding the very definition of a basket. These artists include Dorothy Gill Barnes, Carol Eckert, John McQueen, Ferne Jacobs, Norma Minkowitz, John Garrett, and others. The exhibition also features exceptional holdings by masters from Japan, including Nagakura Kenichi, Jiro Yonezawa, Hisako Sekijima, and Yamaguchi Ryuün. "Intertwined will be a visual feast with highly textural, colorful and boldly shaped sculptural forms suspended from the ceiling and hung on walls, in addition to traditional settings," added Lineberry. "The exhibition and its accompanying catalog, with essays by Kenneth R. Trapp and Ferne Jacobs, provide an international look at contemporary basket-making and its current level of innovation and experimentation." Other artists in the exhibition include Kate Anderson, Dail Behennah, Nancy Moore Bess, Mary Black, Sally Black, Jerry Bleem, Jan Buckman, Jane Chavez, Jill Nordfors Clark, Noboru Fujinuma, Shokosai Hayakawa, Elsie Holiday, Hideaki Honma, Kazuaki Honma, Jan Hopkins, Lissa Hunter, Kiyoma Iwata, Nancy Koenigsberg, Leon Niehues, Pearl Nuvangyaoma, Lindsay Ketterer Gates, Fran Reed, Hideho Tanaka, Tsuruko Tanikawa, Lisa Telford, Maseo Ueno, Dawn Walden, and Mika Watanabe. Exceptional! An amazing collection, and an exhibition worth seeing. MAD, you are lucky indeed.